Here is another addition to our library of goods for social marketing! 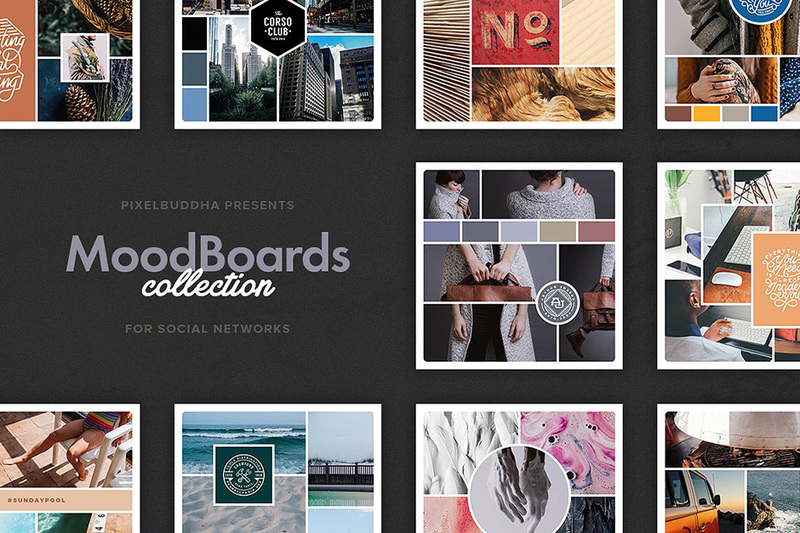 This time it’s something new from our team, a comprehensive collection of Mood Boards for the most popular social networks: Instagram, Facebook, Twitter and Pinterest. It is the perfect working and promotional tool for designers, bloggers, architects, fashion designer, and other creatives! Share your vision with your colleagues, clients, and your audience using ready-to-use mood board templates from our collection! File size is approx 7.2MB (57.9MB unzipped), offered as a single download. I really enjoy having these all made up, thank you. I’d like to make a suggestion, please. it’s hard to find the one I want without a list of some sort. I don’t know which is which and it is time consuming having to click on 16 PSD folders to find the one I want to use. I look forward to more of your work! I can’t wait to use this!!! I appreciate this resource – thank you.